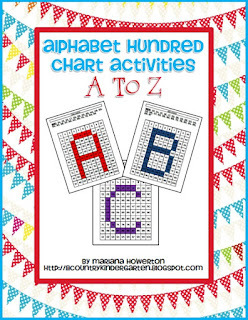 So, in an effort to be productive, I made an Alphabet Hundred Chart Activities: A to Z set for TpT. Instead of revealing a picture on each new page like my other hundred chart activities, a new letter will be revealed! These would be perfect for whole class, small group or centers/stations. I hope you like them! Click on the picture below to take a peek. I would love to give this set away to the first three people who comment about how you could use these in your classroom. Be sure to leave your email address! Thank you to those who commented! Enjoy your new activities! this would be great for fast finishers or centers!! I would love to use these for centers. I would love to put these is my literacy stations! I would use them in centers to reinforce letters at the beginning of the year. I love your 100 charts too! These look great. Would definitely be able to use them in centers throughout the school year to help reinforce letters!! Love this! Another great idea! I love your blog! I would like to invite you to post links to YOUR BLOG at my newly created blog The Teachers' Files. It is intended to be a collection of blog posts to help teachers and educators easily find links to specific topics based on their interests and needs. It is also a nice way to help send traffic to your blog and build your readership. Please check it out and feel free to start linking to any relevant posts you may already have on your blog! Keep up the great blogging!